A new SIM card tray claimed to be a component from Apple's next-generation iPhone has appeared for sale online, sporting subtle differences when compared with the tray found in the iPhone 4S and iPhone 4. 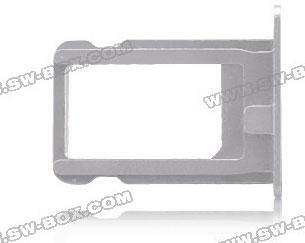 The "iPhone 5 Sim Card Tray Holder Slot" was listed this week at the parts reseller website SW-Box.com. And as noted by MacRumors, the SIM card tray has subtle differences from the iPhone 4 and iPhone 4S. Specifically, the new tray has a "slight tapering of metal frame pieces," as well as "an extra metal shelf not seen in current trays." If legitimate, the part could be seen as evidence that Apple plans to redesign the next iPhone, rather than stick with the same appearance of its predecessors. But rather than implying any drastic changes, the part has only seen minor modifications. There have been some rumors that the next iPhone will have a metal back, replacing the glass back panel that has been utilized with the iPhone 4S and iPhone 4. Those reports also claimed that the side of the next iPhone would be curved, but the latest component implies the side of this particular prototype handset would be flat. The part also suggests that the next iPhone will not utilize the micro-SIM standard that Apple has proposed. A vote on the standard by the European Telecommunications Standards Institute was postponed in March after Apple and Nokia could not come to terms over the design. The latest part comes just over a week after pictures of a new home button claimed to be for Apple's next iPhone surfaced online. That part suggested the next iPhone's home button will look largely the same as it always had, but also gave an indication that the part will be redesigned internally. The parts serve as further evidence that Apple is currently working on prototype models of its next-generation iPhone. In March it was said that Apple was reviewing potential components for the new iPhone, which is expected to be released this fall, one year after the iPhone 4S. It has also been said that Apple's sixth-generation iPhone will feature Qualcomm's "MDM9615" LTE 4G chip for high-speed wireless connectivity. Reports have also claimed that the next iPhone will adopt in-cell touch panel technology, which will allow Apple to make the next iPhone thinner by 0.44 millimeters, or fit in a larger battery.